1. Jay & I stopped working a little early on Friday and we went with Becca out to Roman Delight for dinner (Rachel was working). Watched television in the evening. It's ugly as sin right now. Someone painted it in a yellow/gold/brown faux finish that is hideous. But it is solid wood, OLD, well-built, and we got it for $20. Someday (not anytime really soon) it will be gorgeous again! We visited a few other neighborhood yard sales, found some free wood pallets which were needed for #3 and had lunch at Panera Bread. 3. We rented a storage unit for the burgeoning pile of projects we have with our upcoming business venture (more on that in a future post!) and moved some of the projects we aren't getting to anytime soon there. 4. Saturday night we watched the last episode needed to bring us to "caught-up" status with the Game of Thrones series. Jay & I have binge watched all five seasons over the last couple months. 5. Sunday - the girls wanted to go to the shore, but Jay & I were concerned that it would be overly crowded and not warm enough to spend the day laying on the beach. So Jay suggested Bushkill Falls. Who knew that the entire world would show up at Bushkill Falls on a Sunday afternoon in the middle of a holiday weekend??!! and see the falls and take pictures. Rachel and Becca must have taken at least a hundred selfies! What should have been a peaceful, relaxing nature hike turned out to be crowded and LOUD. The buzz of thousands of people speaking probably a dozen different languages managed to drown out the rush of the water over the falls! But we made the best of it. And learned a good lesson about holiday weekend travel. 6. Picked up some Boston Chicken on the drive home and rented American Sniper for the evening's entertainment. 7. Monday morning Jay & I headed out early to check out Jake's Flea Market. The weather was absolutely gorgeous and it was lovely being out. Picked up a lot of little things - old tools, a counter height stool, a copper pot. And stopped at the grocery store to pick up our Monday dinner fixings. 8. We spent Monday afternoon sanding, painting, upholstering - generally finishing up a few of the projects that have been in the works for awhile. Jay forgot to take a "before" photo of this chair in it's original state which was a dark wood and really beat up. The before photo shows it with a coat of primer. I custom mixed the color for the chair to go with the fabric I had chosen. I really love the final look! We have a pair of these chairs purchased with that red print just laid on top and underneath a stripe fabric that looked like a cat used it for a scratching post! The fabric in the after shot is actually a deeper teal color which I couldn't get to color correct from Jay's photo. But it looks great. Sarah has claimed these for her apartment! 9. We had grilled cheeseburgers, corn on the cob, potato salad, and fruit salad for dinner. With strawberry shortcake for dessert! Yum! 10. Between the flea market, grocery shopping, dinner fixing, and refinishing work, I had been on my feet all day. I collapsed onto the sofa at 8 p.m. to watch Sunday night's episode of Game of Thrones on demand. Oh, and I did some laundry! And went to bed at 9:30. 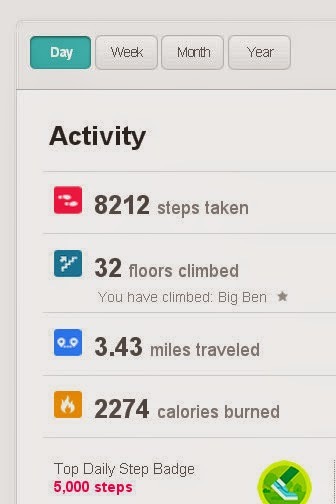 Thus endeth my holiday weekend. Waving hello to Sian and all the "Me on Monday" folks, albeit a little bit late. Your upcycling projects are looking great....the dressing table is fab and will look wonderful once it has had its makeover. Over here we have 'chalky paint' that can be painted direct onto old furniture without any undercoat....don't know if you have it over there. Your laundry certainly got some attention :). Sorry to read about the crowds - Himself and I tend to schedule staying at home/walks from the front door on what we call bank holidays. Your re/up-cycling projects have turned out really well, and I'm intrigued to know about your future plans too :). Love that family photo! And that dresser---I had a similar one growing up---painted white, but in addition to the small drawers there were two large drawers on the bottom so it didn't have a stool. I wonder what happened to it. I loved the mirror. Can't wait to see what you two do with it! 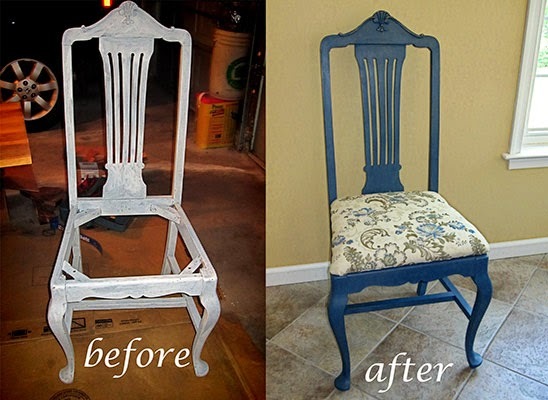 LOVE those refinished chairs. This must be a very satisfying hobby! The chairs look wonderful. Really love the blue one! Ah yes, my husband and daughter decided on the coast for a Bank Holiday day out. I was sceptical! As it turned out my boy woke up feeling rough and couldn't face the travelling so they braved the traffic and crowds on their own. Those chairs look brilliant. So fun to see the before and after. I missed out on my weekly fix of Outlander as it wasn't shown in the US because of the long weekend. You are going to be busy with all your new projects! 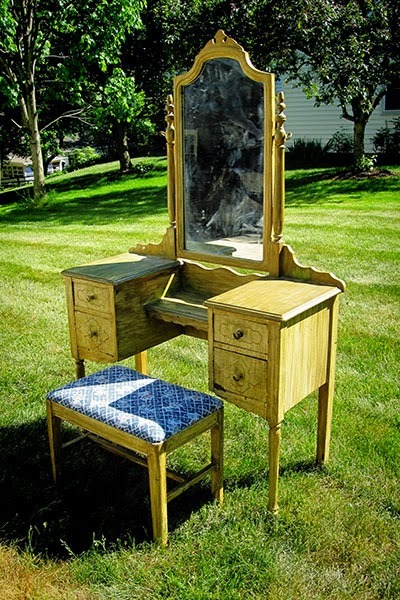 Love the before and after pictures - keep us updated with the dressing table. We tend to stay home at Bank Holidays because I hate queuing in traffic - interesting to hear you have the same problems over there! You were busy this past weekend and you got a lot accomplished. However, I had to laugh a bit how much laundry you do. That is actually a household chore I love to do, especially hanging the laundry on the line. Your daughters are beautiful! I hope your next outing with them won't be a crowded and loud. An upcoming business venture? Sounds intriguing. I'm looking forward to hearing more..
Yard sales like that don't really happen here..more's the pity. I can just imagine me driving about all weekend looking for the next good one! Sounds like a fabulous weekend (minus the crowds!). What a great garage sale find for $20 - can't wait to see what you do with it. 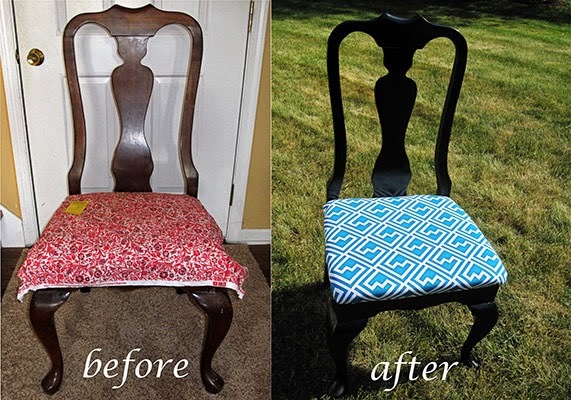 Those chairs turned out fantastic. Your projects look great and they must be so satisfying to complete. Your blog challenge went well I have popped in and out to read them. 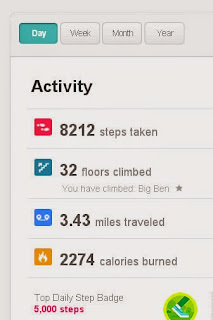 I haven't been motivated at all since we came home from our holidays. Looks like a fun but busy weekend. Wookie says it is against his religion to drive anywhere on a long weekend... Just too much traffic!